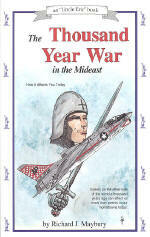 The Thousand Year War in the Mideast: How it Affects You Today (Book 9, Uncle Eric series) by Richard Maybury. Written in 1999, this book is especially relevant now. It explains what has happened/is happening in the Mideast and how it affects us now and in the decades to come. Besides being an excellent book for investment strategy, this book can be used in studying World History, European/Mideast history, Government, Economics, Business, Finance and current events. It shows how past events affect current events.